Recently I found myself reflecting on my initial genealogy experiences. My first real experience with Hispanic genealogy was at the Family History Library in Salt Lake City. It was in the first lower level (aka B1), in the dark back corner as I cranked the handle on a microfilm reader that was older than I was. I can still remember going image by image, reviewing each one for the parish baptism record of Lino Gallegos in the small town of Rueda, Spain. I can also still remember how excited I was when I found that baptismal record. Fourteen years later I am amazed at the advances in the field of genealogy, but also surprised at the misconceptions as well. For example: I regularly come across people who think that everything is available online and with a simple Google search you can find everything you ever wanted to know about your family history. Others will dig a little deeper by doing a couple of searches on Ancestry.com or FamilySearch.org - more often than not coming away disappointed. Whether we like it or not...nearly all of us are going to need to open a book or even make a trip to a library or archive to find our ancestors. I know that I've said it before...but I think it's time that I start blogging again. It's time to get back to the basics. It feels like people need assistance finding their ancestors now as much as they needed it fourteen years ago (maybe even more). In upcoming posts you will read about new and exciting efforts in making genealogically related records more accessible online, but you will also be reminded some things still need to be done in the dark corner of a library or archive. 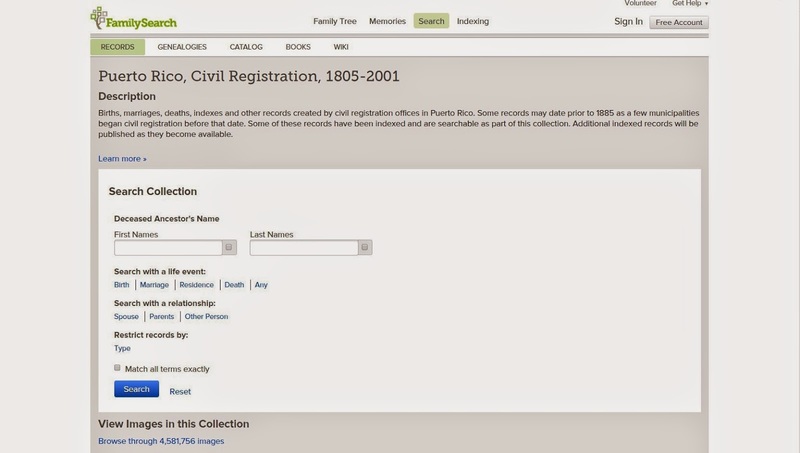 It's been a long time coming, but FamilySearch finally published the index to their Puerto Rico civil registration collection (births, marriages and deaths). You can find the collection here: Puerto Rico, Civil Registration, 1805-2001. The collection mainly covers 1885-1950ish, but some the collection has some earlier and later years for some municipalities. More than 4.8 million birth, marriage, and death certificates are now searchable by name. The collection is free to use - happy searching!